Resolution! Turns out the instrument cluster was defective. Got a new one and everything is roses. Thanks for all the advice, pointers, etc. Hi guys, Looking for a little help. Just replaced the alternator and everything was fine for a couple of days. Then CEL comes on steady, along with the cruise control light, temperature light, and low fuel light. The tachometer is also not working. Everything else (gauges, etc) is fine and car is running great. Put my OBD scanner and NO codes come up at all. I think it might be a grounding problem, but am not sure. Anyone see anything like this? Any pointers would be appreciated. 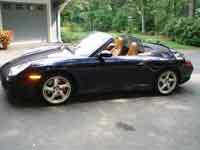 Thanks in advance, Al Nugent 2005 Carrera 4S Cabriolet. 26,600 miles.